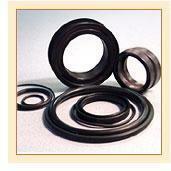 This rubber has extraordinary resistance to harsh chemicals and heat. They are enable to withstand virtually any process media, including reactive plasmas, at temperatures as high as 327°C. In plasma and chemical vapor deposition applications, perfluoroelastomers can withstand long term exposure in etching, stripping and cleaning processes. In wet chemical operations, swelling due to prolonged chemical exposure and poor elastic recovery are frequent causes of seal failure. These inadequacies are eliminated in perfluoroelastomers. The reliability of seals made from perfluoroelastomers leads to reduced wafer yield losses and lowered frequency of maintenance and operations disruptions.